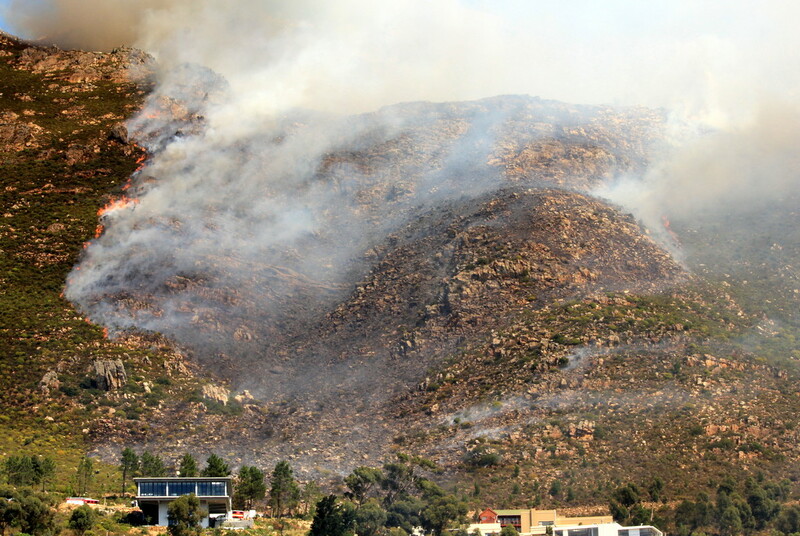 Fire on the mountain above Gordon's Bay on Thursday. The first sign of the fire was a faint whiff of smoke behind the lower pine trees on the left (behind the rather square house). Half an hour later it was totally out of control and had raced up one ravine before jumping over into the next. The wind started blowing but luckily across the face of the mountain so stopping the fire from spreading to the left or further down to the houses. Firefighters, including three helicopters and two spotter planes, managed to get it under control by about 6pm. I'm uploading this shot to give an idea of how close it was to the houses. Golly gosh! This is quite unique - we have lots of forest or bush and paddock fires but you can't really see them from anywhere! This must have been absolutely terrifying Gillian........I think fire is so frightening & those beautiful houses so vulnerable! Thanks for showing. How scary for the people who live in the houses. We lose a lot of forests and houses in our bushfires here in Australia. Good grief! That looks so scary. I cant imagine what the homeowners were going through! It must've been some tense moments for the people in those houses! A fabulous shot of the event. Always such a worry at this time of year. Super capture though. We heard about the fire but I couldn't find out any more. Was going to email you this morning but then I saw your postings! It is a lovely capture Gillian. Always sad when the mountains are on fire. Thankfully, we have the best of the best mountain fire fighters in the world. What a capture...very scary looking. !